Pearl River, Hancock, Harrison, Jackson and Stone. 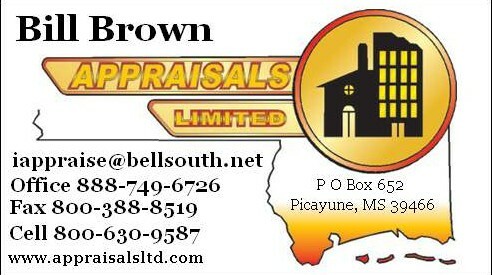 Residential, Land, Commercial, FHA, REO, Manufactured Home and Modular Home Appraisals. We have an average turn around time of 3 to 5 working days for most appraisals. We use Uniform Appraisal Dataset(UAD) compliant software or we can send appraisals out to your email address in a PDF file format.You can order your appraisal by fax, Mercury Network Xsite or email. 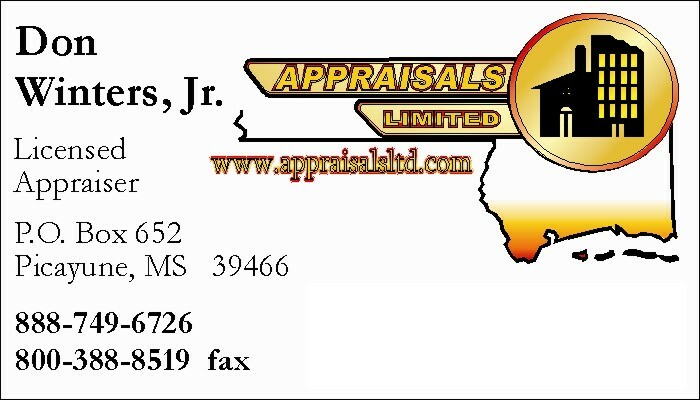 ORDER APPRAISAL ONLINE BY CLICKING HERE.